You are invited to participate as a vendor in the upcoming Business Resource and Membership Drive for the Bellwood Chamber of Commerce. This event will take place on September 15th, 2017 at Stevenson Park, 3105 Washington Blvd, Bellwood, IL 60104. Simply put, small businesses have consistently played a major role in economic growth because they create so many jobs, however, only about two-thirds of businesses will survive 2 years in business, and half of all businesses will survive 5 years. We want to help change this epidemic. We anticipate a minimum of 250 businesses from the western suburbs will be out at this business resource fair looking for information on how to expand and grow their business. We are looking for vendors that have information that will help businesses start, expand and grow! Please complete the attached vendor application or (in Word format) and return it no later than September 5th. The vendor fee is only $150. (Pay online below.) Vendors should be prepared to be set-up no later than 7:30am on the day of the event. We will provide you with a table and two chairs. Please bring your own table cloth and display. For any additional questions or comments please contact the Event Coordinator, Pam Lawrence or Christopher Parker at (708) 397-6646, or Kamil Brady at (708) 612-1290. 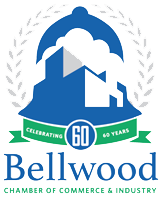 You can also reach us by email at bellwoodchamber@gmail.com.